We got another pair of tickets to an advance screening last week (Thursday to be precise). 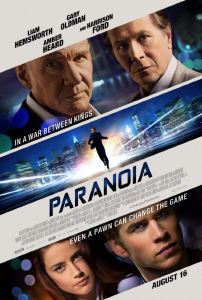 This time for the thriller Paranoia. It had a promising enough cast, Liam Hemsworth, Gary Oldman, Amber Heard and Harrison Ford, but it just didn’t live up to its potential. The acting was solid enough and Gary Oldman’s character was great but otherwise it just seemed very bland. It’s kind of Wall Street crossed with today’s cellphone obsessed culture but without the subtlety or style of Wall Street. For some reason I’m immune to the smartphone craze so maybe that was it. Overall, a very middle of the road thriller. Not the worst film we’ve watched this year but not one I’d want to pay to see. Incidentally, I’ve started posting all the movies we watch (both on TV and at the cinema) to Pinterest. It will be interesting to look back in a couple of years and see what we’ve watched. I do the same thing for books.